"ECOBOTTLES" LLC was founded in 1994. 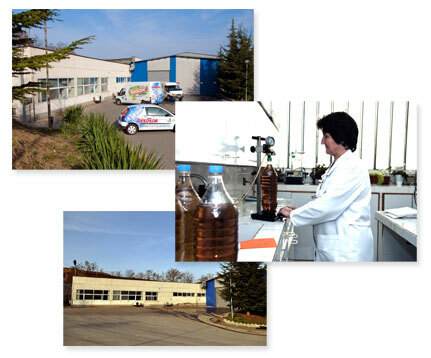 The Company is located 100 km south from Sofia. Bottling of table water "PREDELA". Offered aerated and flavored. Bottling of aerated soft drink product line “SERINO”. Bottling of non-aerated soft drink product line „OLYMPIA”. Manufacture of РЕТ bottles with different capacity (polyethylene terephthalat). The soft drinks are produced under the original recipe of "Doller – Germany", based on their original raw materials. The technology and the production line are imported from DIDEL – France. It has a capacity of 4500 bottles per hour, or if it works at full capacity it can produce annually up to 25 million bottles. The production circle is closed and includes lining up bottles, filling, labeling, packing and palletting. This guarantees the hygiene and quality of the product. The regular quality control of the production is performed in contemporary equipped chemical and microbiological laboratory. "ECOBOTTLES" LLC is certified for ISO 9001:2000 and ISO 22000:2005.